Spaniels of all sorts, from Cocker Spaniels to King Charles Cavelier Spaniels to Springer Spaniels. 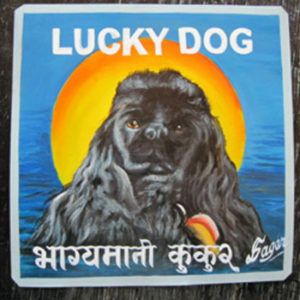 Lucky the Black Cocker Spaniel is hand painted on metal by Megh Raj Thapa. 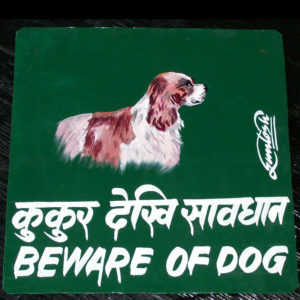 The Devenagari script (Nepali writing) reads ‘bagamani kukur’ or lucky dog. Lucky is a lovely black Cocker Spaniel – the first in the Danger Dog project. This portrait by Sagar really brings out her cute face and luxurious black coat. 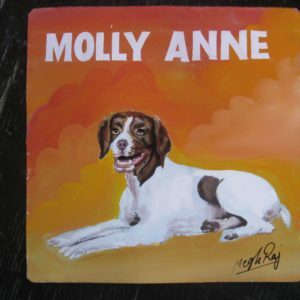 Molly Anne is a beautiful Brittany Spaniel hand painted on metal by Megh Raj Thapa. 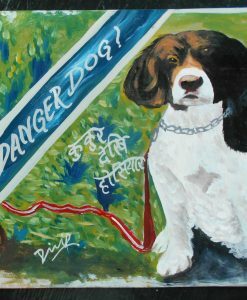 This hand painted portrait of Charles the Cocker Spaniel is by Megh Raj Thapa. 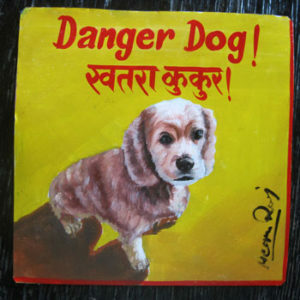 The yellow background and bright red border lend drama to this painting on metal. 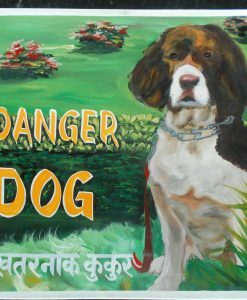 Chip the Cocker Spaniel is an unlikely Danger Dog in Baba’s colorful portrait. 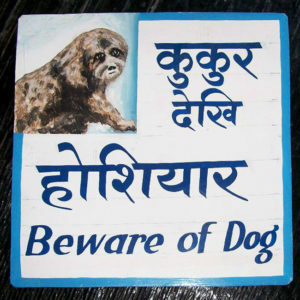 Chip the Cocker Spaniel and a very naive beware of dog sign hand painted by Gyan. 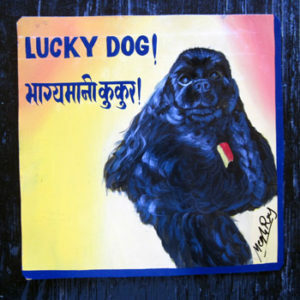 Gyan’s style is typical of what you might see on the streets of Kathmandu. 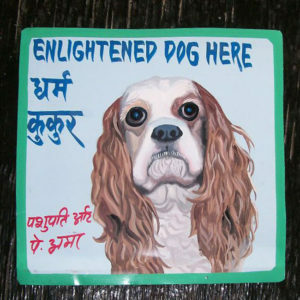 Chip the Cocker Spaniel as painted by Nabin, a signboard artist in Boudha, Nepal. 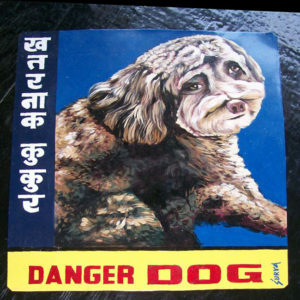 Nabin’s beware of dog art is 15 inches across by 12 inches high and has a delightful cartoonish feel. 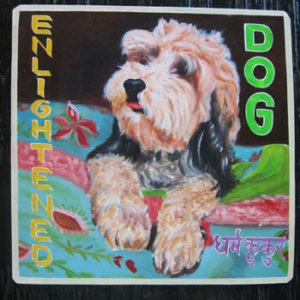 Jasper is a handsome Cockapoo, (Cocker Spaniel mixed with a Poodle) hand painted on a bright rug by the artist Sagar Bitsa, a signboard artist in Nepal. Cosmo the Cavalier King Charles Spaniel by Amar Shrestha features Cosmo’s underbite. 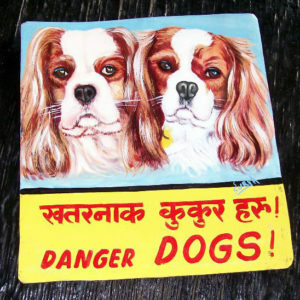 Ollie and Lillie are a cute pair of Cavalier King Charles Spaniels hand painted on metal by Baba, a signboard artist in Nepal. 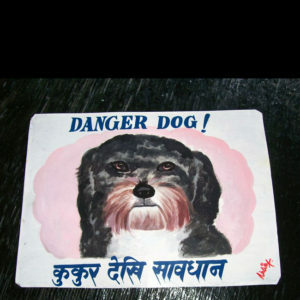 This Beware of Dog sign is currently available at the Santa Monica Museum of Art. Their contact information is available at smmoa.org. 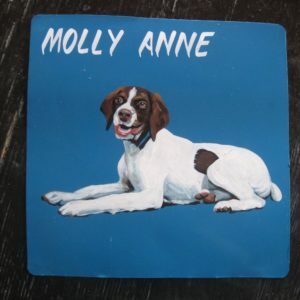 Grady’s portrait is hand painted on metal and is approximately 12″x12″. 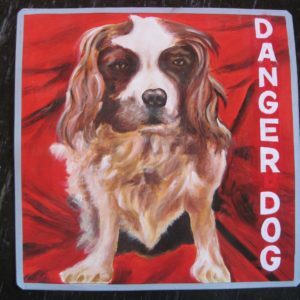 This little King Charles Spaniel is a classic Beware of Spaniel sign, very like the beware of dog signs that inspired this project in the first place. This unusual painting is a portrait of two pets that lived in different decades – the 1970s and the 80s. 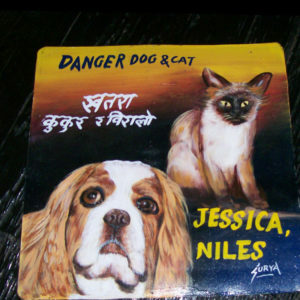 Jessica and Niles are a one-of-a-kind portrait of two pets by the incomparable Baba.